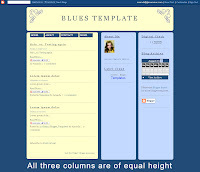 An issue of blog design is that CSS based layouts cannot produce columns of equal heights. For example, when designing a two or three column template, it is almost impossible to make the sidebar(s) stretch to the length of the main posts column. This is particularly noticeable when a background color (or image) is used for the sidebar which does not stretch to the length of the page. This issue is also relevant for those who display their blog posts side-by-side on the home page. Posts which are of equal height would appear in a harmonious grid-like format which is more pleasant to the eyes, whereas posts of unequal length disrupt the grid-like pattern and can often cause disarray in the layout. For example, if we use the class of "column" for both the main posts section and sidebars in our blog template, the script will ensure that the main column and both sidebars appear of equal length when viewed in a web browser. 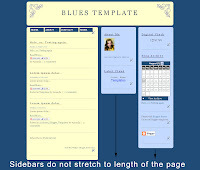 Enables columns to be of the same height for better blog designs. Derived from a script by Alejandro Gervasio. How it works: just apply the CSS class of &#39;column&#39; to your pages&#39; main columns. Once you have pasted this section of code in your template, proceed to save it. If for some reason you have made any errors when pasting the code, you will receive an error message and be unable to save. Now to make sections of your Blogger layout have equal heights, we need to apply the class of "column" to those sections in the actual template code. I will offer two variations of how this can be achieved in this tutorial: making the sidebar and main-wrapper equal height, and making all posts equal height (for use when making posts appear side-by-side). This method works best for layouts including at least one colored sidebar (whether this feature a background color or background images for effect). There are many different non-standard templates using this style of layout, so it's likely that the identifiers of the divisions referenced here could be different in your own template. To make the sidebar(s) and main column of equal length, you will need to add the class of "column" to these divisions in the template. If you cannot find <div id='main-wrapper'> in your template, this may be called 'main-wrap' or 'main-section' instead. Use your discretion to find the appropriate code tag; you can always change things later! Next, you need to add the class of column to your sidebar or sidebars. If your template features more than one sidebar, this could become a little complicated though I will do my best to explain! The main sidebar could also be called 'sidebar-wrap', 'left-sidebar' or even 'left-bar' depending on the template you are working with. Again, use your discretion and add class='column' in the place you think most appropriate for your template. This also applies in templates where you have a second sidebar. It may be named <div id='sidebar-right'> ; 'right-sidebar-wrapper', 'new-sidebar-wrapper' or something entirely different. Simply add class='column' inside the division tag which you think references the correct section in your template. If all looks well, you can proceed to save your template and enjoy your new matching columns. If your sidebar and main column do not appear at equal heights, clear your edits and begin again being sure to check the placement of the class='column' sections you have added. This method is particularly useful when using my recently posted customization to display posts side-by-side on non-item pages. Using this method ensures your posts appear in a grid-like fashion with spaces beneath shorter posts so all headings are correctly aligned. For this example, you will need to ensure you have checked the "Expand widget templates" box on the Edit HTML page, as we will be adding the class of "column" inside the main posts widget. This is because divisions can have more than one "class" (though they can only have one "id"!). Once you have added this extra class to the posts section, preview your template to see that your blog posts are now all of equal height. If you choose to make your posts of equal height, you must consider that all of your posts will appear as long as your longest post. So if you have one particularly long post on your home-page when all others are relatively short, there will be long gaps beneath all of your shortened posts! You can also adapt this script and methods to add columns of equal height to your blog footer (in conjunction with my three column footer hack, perhaps! ), or to any other areas of your blog template which you would like to be of matching heights. I hope you have found this tutorial to be a useful addition to the arsenal of Blogger customizations and tutorials posted here on Blogger Buster! Please feel free to leave your comments or let us know how you have used the matching columns script in your own designs by typing your message below. Issues with the embedded comment form?